He won eleven Tour events, including the 1989 PGA Championship and the U.S. Open in 1991 and 1999. He was a two-time winner of the Hassan II Trophy in Morocco. At the time of his death, he was ranked third on the all-time money list and in the top 10 of the Official World Golf Rankings—he had been ranked in the top 10 for almost 250 weeks, from 1986 to 1993 and again in 1999. 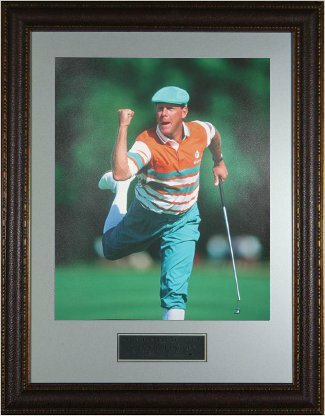 This is an Unsigned 11x14 photograph featuring Payne Stewart doing a Fist Pump w/ a Leg Kick. Custom Leather Framed and Matted.